Shipping containers play a vital role in getting goods moved all across Australia and there is a common need to have these containers loaded onto the back of a truck or trailer and moved through metropolitan areas and through regional areas, both intrastate and interstate. Highlighting the importance of finding shipping container transport. Shipping containers are large and heavy and it can be a big job to have these moved. Cranes make life easier when it comes to getting the container relocated onto the back of a truck for transport. Whether you need to have a standard shipping container, an ISO container or a large generator container shifted anywhere throughout Australia, then you want to find a reliable and highly experienced shipping container transport company to perform this job for you. Get quotes for shipping container transport today! Get 3 Quotes for transporting shipping containers. It’s free to request quotes. What shipping containers are relocated? 10 FT, 20 FT & 40 FT Shipping Containers: Container lengths range from 10 ft, 20 ft and 40 ft but they all have generally the same width and height. A shipping container transport company with a tilt tray is one of the most convenient and widely used methods for moving containers. A standard tilt tray can carry a maximum of a 20 ft container but can also carry a 10 ft if required and a semi can take a 40 ft container. If you have a single 10 ft or 20 ft, the better option to save on costs is a standard tilt tray. The shipping container is loaded by the lowered tray reversing and winching the shipping container onto the flat bed in the absence of a crane. If a crane truck is used, this can fit a 10 ft, 20 ft or 40 ft shipping container. 20 FT ISO Tank: These tanks are designed to transport bulk liquids and this tank is then freighted within a crate. Measurement is based on the dimensions of the crate, which can be either 20 ft. A shipping container transport company with a semi-trailer tilt tray can carry a larger freight of two 20 ft containers. If you have a single 20 ft, the better option to save on costs is a standard tilt tray. If you don’t have the required space in front, behind or beside the container generator, then a crane truck is the best option. Cranes would be the preferable method of loading and unloading, so advise if this is available. 20 FT & 40 FT High Cube Containers: This type of container is similar to a standard shipping container, except that it is an additional one foot taller. High Cubes are perfect for bulky items that require additional room. They can come as an extended length of a 45 ft option too. A shipping container transport company with a drop deck trailer is advisable to accommodate for the additional height. When loading with a semi tilt tray additional space is required in front or behind the shipping container to accommodate for the collective length of the semi and the container. A semi will also require a larger area to reposition to enter and exit the property upon pickup and after delivery. 20 FT & 40FT Refrigerated of Reef Containers: These are utilised to prevent spoiling of food products and beverages that need to be kept at a certain temperature through transportation. They come in 20 ft and 40 ft sizes and the size and type of shipping containers is a major factor in determining what type of trailer the truckie will need for pickup and delivery. This will also factor in the pickup and delivery costs of the container. If you don’t include in the description some details as to the access available around the site and the container, you’re going to get the wrong container moving companies quoting on job. 20 FT & 40 FT Flat Rack: Built with solid end walls and no side walls, flat racks have fixed-ends, where the walls are rigid or collapsible where the end walls can be folded down. The collapsible walls are easier to transport, as it allows the containers to be stacked to relocate multiple containers at one time. Access on the site to the shipping container plays a major part in the type of shipping container transporter required. If a crane is available at loading and unloading for the transporter to utilise, then you can advise them of this when you speak to them about costs and rates. 20 FT & 40FT Electric & Diesel Generators: A crane-mounted truck has a flatbed that can fit a 20 ft or 40 ft container generator. A shipping container transport company with a side loader can be utilised in instances where access to the container is limited, particularly when there is inadequate space in front of the shipping container or at the back for a tilt tray. In this situation, a side loader allows for the container to be moved whilst lined up length ways beside the truck. 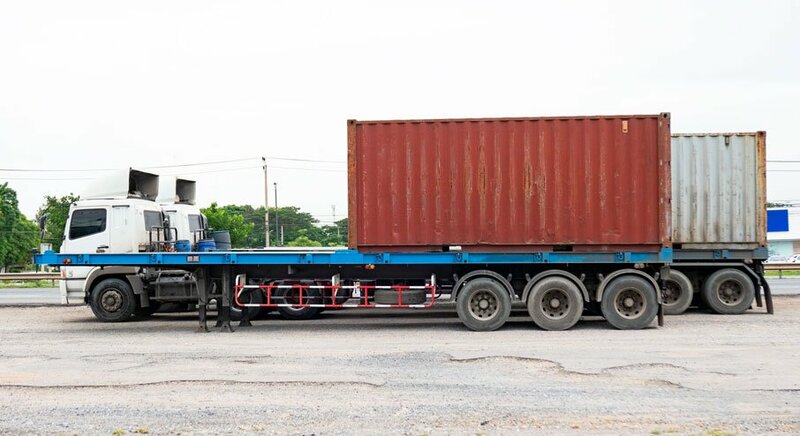 Shipping container transport is logistically difficult and must be performed by an experienced and reputable transport company with the correct vehicle and equipment to shift the container or containers. Cranes are the most effective means for loading and unloading, although they can be loaded by shipping container transport companies onto the back of tilt trays and side loaders when required. FreightQuotes can connect you with dedicated and highly skilled shipping container transport companies simply by filling out our free online get quotes form. This quote request is then sent to the shipping container transporters registered with FreightQuotes and three of these companies will call you with costs and rates to move your container. Simple, fast and effective. Shipping transport is available Australia wide. This includes interstate, regional and metropolitan shipping container freight covering all states and capital cities including Adelaide, Brisbane, Perth, Darwin, Melbourne, Canberra, Hobart and Sydney. Need other heavy freight moved? You can find quotes for any type of freight, including portable buildings and even trucks.